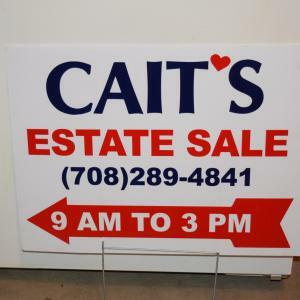 Welcome to Cait's Consignments and Estate Sales! Give us a call for a free Estate Sale consultation or consignment inquiry at 708-995-7746. You can also email us at caitsconsign@gmail.com . We offer estate sales at your location but because of our warehouse and retail of services we can also welcome estate buy outs, warehouse sales and consignments! We also offer new furniture, home goods and kitchen gadgets at our new retail store, Cait’s Kitchen and Home located at 19170 LaGrange Road Mokena, IL 60448. We carry Magnolia Home Furniture, Swan Creek Candles, Norpro, Door County Coffee and more! Cait's Windy Hill of Frankfort Estate Sale! This company has posted a total of 360 estate sales. Only the most recent 50 sales are shown.